Eric's advice to WUWT-ers who live on the sea shore, is to raise the floor of your house every twenty years. The WUWT article said that Gavin Schmidt's advice was "whacky". It's Eric's advice that needs to be "whacked". Eric read an interview with Gavin Schmidt in the Vancouver Sun and picked out one question to write about. Gavin was asked about the future for waterfront cities like Vancouver. He replied that sea levels aren't going to go down. He also pointed out that there is a huge difference between a rise in sea level of one or two feet a century and a rise of one or two metres a century. Gavin wryly commented that the basement won't be the best place for electrical equipment. Eric did some arithmetic and discovered that two metres in a century worked out at two centimetres a year. (He's not all dumb.) He figured that it would be okay to just lift the house forty centimetres every two decades. I don't know what sort of house Eric had in mind. If the house were made of straw, then lifting it wouldn't be too difficult. If it were made of twigs, then it's a bit more of a challenge but do-able. However, if it were built of bricks, then you'd risk the house cracking and collapsing if you tried to lift it by forty centimetres. One thing that Eric didn't mention was storm surges or sinking shores. It's not just the level of the sea when it's level that causes problems. It's the difference it makes when a high tide coincides with a major storm and washes away beaches, cliffs and buildings. 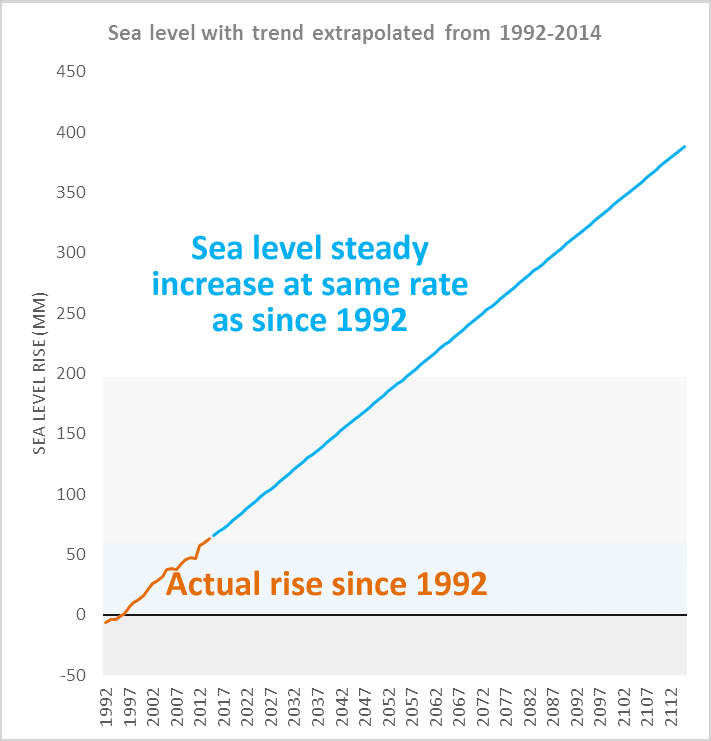 Eric also assumed that the sea level rise would be steady. It won't. Ice shelves will be eroded and then huge slabs of ice sheets will slip into the sea and melt. When the ice sheets in Antarctica start shifting into the sea with a vengeance, then it won't happen in a nice steady fashion. There'll be bursts and then a break, then another burst. Probably the same with Greenland - though the big melt from Greenland is expected to start a bit later than that from western Antarctica. It's hard to say just when the ice sheets in Antarctica will begin to cause a sudden sharp rise in sea levels. As each year passes, there is more evidence that it's not just west Antarctic ice sheets we have to be concerned about. There are signs that eastern Antarctica might start to melt sooner rather than later, too. In addition to the paper, the authors also wrote an article, because apparently some people got mixed up between sea ice (frozen sea water), ice shelves (floating ice from glaciers sliding into the sea) and ice sheets (on land). The article is very clear, and worth referring people to next time you come across a science denier talking about sea ice in Antarctica. The paper was about the ice shelves. Ice shelves float on the sea water and are attached to ice sheets on their continental side. They are what slows the ice sheets when they flow into the sea. When they disappear, there's nothing to stop the ice sheets flowing straight into the sea - and that's when the sea level will rise a whole lot more quickly. The ice shelves are melting faster and faster, most particularly around western Antarctica. This and other studies also showed how in some areas, the ice sheets themselves are getting more slippery underneath as warm water percolates through them. ...For the ice shelves in the AS [Amundsen Sea], observed rates are highest near the deep grounding lines, with lower rates found toward the shallower ice fronts (Fig. 2, table S1, and movie S1). This pattern is consistent with enhanced melting underneath the ice shelf forced by an increased flux of circumpolar deep water (CDW) from across the continental shelf and into the sub–ice-shelf cavity (12, 23, 24). The consequent loss of ice-shelf buttressing from increased ocean-forced melting may have driven the grounding lines inland (25) to a point on a retrograde bed slope at which the marine ice-sheet instability mechanism can take over the dynamics of ice export (7, 26). Hence, observed ice-shelf thinning reflects both ocean-induced basal melting and increased strain rates resulting from faster flows. Our analysis shows that thinning was already under way at a substantial rate at the start of our record in 1994. We find the most dramatic thickness reduction on Venable Ice Shelf in the Bellingshausen Sea (BS), with an average (and maximum) thinning rate of 36.1 ± 4.4 (64.4 ± 4.9) m/decade, respectively (fig. S1 and table S1). This ice shelf has lost 18% of its thickness in 18 years, which implies complete disappearance in 100 years. 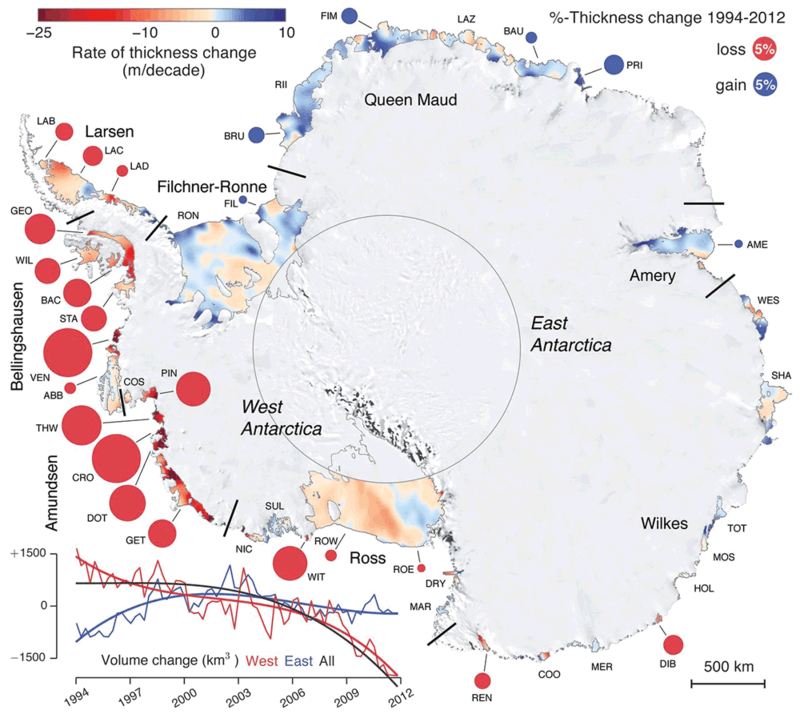 We have shown that Antarctic ice-shelf volume loss is accelerating. In the Amundsen Sea, some ice shelves buttressing regions of grounded ice that are prone to instability have experienced sustained rapid thinning for almost two decades. If the present climate forcing is sustained, we expect a drastic reduction in volume of the rapidly thinning ice shelves at decadal to century time scales, resulting in grounding-line retreat and potential ice-shelf collapse. Both of these processes further accelerate the loss of buttressing, with consequent increase of grounded-ice discharge and sea-level rise. I started writing this article last night. Since then there hasn't been another article at WUWT, so this one was where all the deniers vented their denial - with another 160 or so comments added to the 66 from the first time I archived it. A lot of commenters are of the "stupid" category, doing what stupid people often do, claim that it's the Director of NASA GISS who is "stupid". Yeah, right. The agency that first sent men to the moon stupidly appoints a stupid person to head up one of their most important divisions. Others are variously conspiracy theorists, scientifically illiterate or deliberate disinformers. Knowing that hydraulic fractures less than 2500 feet in depth tend to be horizontal, the sea level rise / subsidence problem can be cured by lifting the ground with hydraulic fracturing using concrete, gravel, or anything that can be pumped and used as a permanent propant. This idea should make the day for a select few. It actually is not a new idea and has been used in the past such as the tower of Pisa. Anyone who elevates model outputs over measured data is not a scientist, full stop. tumpy knows that seas are going to rise, quite a lot. But still thinks Gavin is stupid because he talked about existing homes, not future homes. And about Vancouver (in an interview with the Vancouver Sun), not the UK. Gavin must live in a cave, does he honestly think for a second there are not strict planning controls around floor levels in coastal areas and that engineers are not thinking about sea level rise??? Seriously? In the UK for example, houses MUST be built above the 1 in 200 yr tide level plus climate change (say 0.5m) plus a further amount of freeboard (typically 300-600mm depending on uncertainty). That applies to all new houses, so Gavin, you can sleep at night, the mitigation has been going on for years as no one ever seriously thought a carbon tax was going to stop the sea rising! 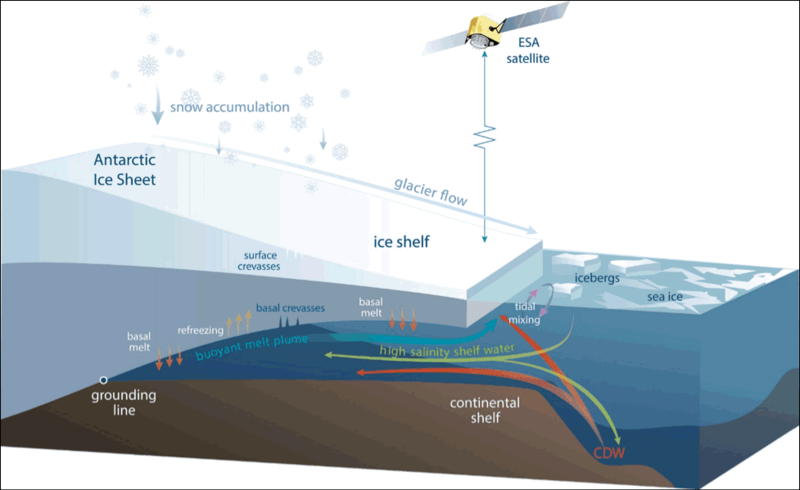 Confused about ice shelf decay and sea ice increase? Explaining Antarctic ice types and their different responses to climate changes. An article by Fernando S. Paolo, Helen A. Fricker, and Laurie Padman on the Scripps Glaciology Group website. There are many more, if you search. 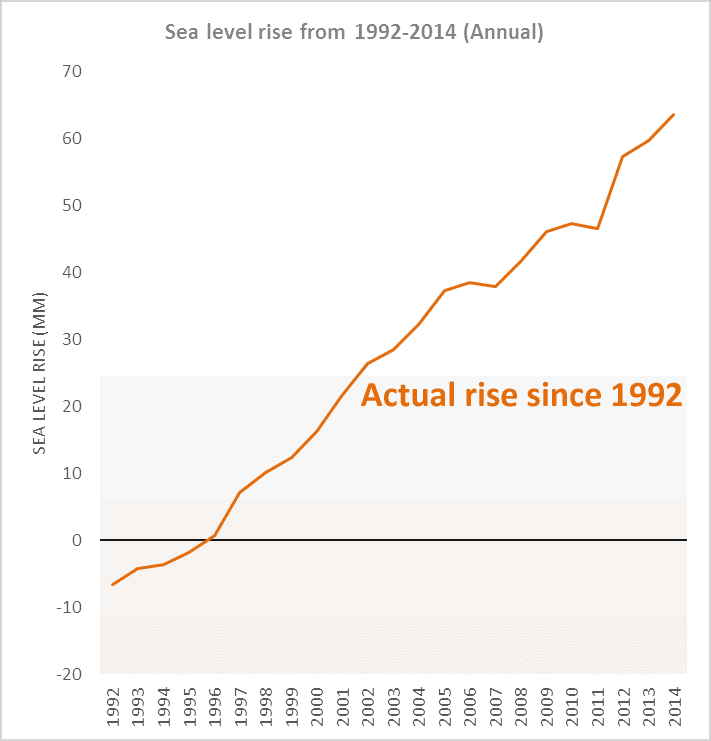 I recall that it was not long ago that WUWT was telling us that sea level rise wasn't happening. That was based on their usual method of 'analysing' trends using short term noise and, also, Nils Axel-Morner's single tree in the Maldives. I wonder when it was they admitted they were wrong and issued an apology for posting such garbage. That is impressive. I'd no idea. I'd say doing that as described would be preferable to going down the path that Eric suggests. Chicago is on the shores of a lake that fills a depression left by glaciers about a km thick in the last ice age. The bedrock under Chicago is very stable and non porous. It is relatively easy to move heavy buildings on flat firm ground. Try it on sand or limestone. Lakes do not suffer from tides or storm surges as much as oceans. It seems that for cities like Miami that are built on porous bedrock the future is very bleak. There was an excellent article (that I'm sure most here are already familiar with - but just in case) in Rolling Stone Magazine. Hotwhopper is a fantastic resource. How the hell does Sou maintain this standard? The woman is a giant. Has anyone over there suggested lowering the ocean floor by 40cm every 20 years instead? 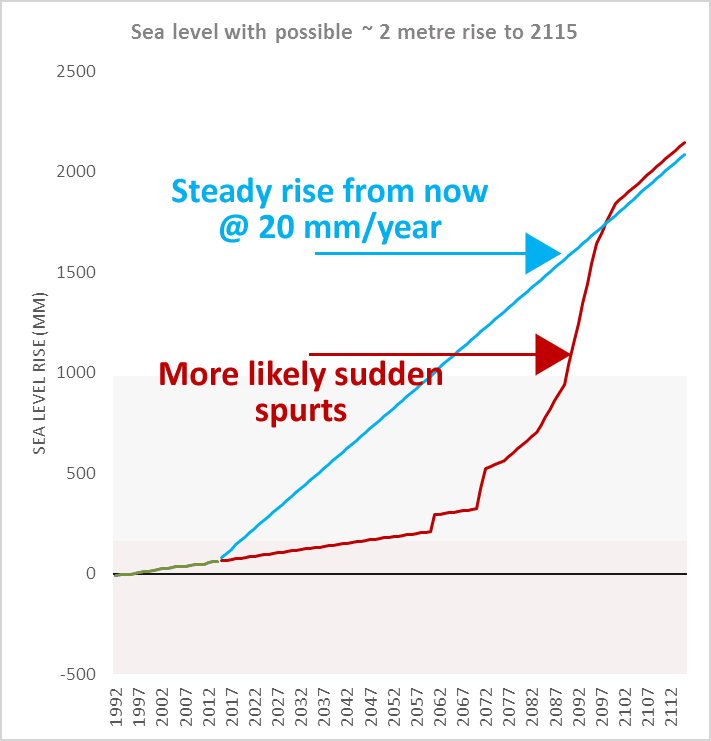 A 20 cm rise in sea level doesn't mean the next storm surge will be 20 cm higher. It will be considerably higher than 20 cm with some of the extra water being pushed up onto land. At least, that is my understanding of it based on very preliminary reading and hazy memory from a few years back. Dan, you are correct, but there are subtle effects, too. Where I live (in Hawaii) a coastal reef about 300 m offshore provides a barrier to storm surge and tsunamis. The rising sea level has subtly altered the near shore current patterns causing unanticipated (as far as the current homeowners on the shore are concerned) erosion and deposition. I walk the beach every week or so (for the last 20 years) so I watch these things happen. My view (and supported in part by our local coastal expert at UH) is that the daily tides and waves slosh over the reef a bit more adding a bit more water to the inside-the-reef system. This water needs to flow back out through existing channels in the reef, but simple hydrodynamics says that as the volume of water input into the system increases, that same (increased) volume most flow along the shore and out the channels. The along shore water must now flow faster or wider or both to maintain mass balance. This subtle but real change in currents is what is causing some of the changes we observe ... on top of a whole bunch of other shoreline erosion/deposition effects such as the El Nino/La Nina and human caused shoreline modification (sand replenishment and sea walls, although there are few on Kailua beach). The issue facing homeowners along beaches in Hawaii and elsewhere is how to cope with this increasing shoreline erosion effect ... not so much to protect the house, but to protect the land value which is around $20M/acre! Even I am concerned that property values will not only stagnate, but in the not too distant future there will be no buyers, even for those of us living a few hundred meters inland who do not worry about storm surge!
" just lift the house forty centimetres every two decades." Or, the Department of Energy could build us the 100% renewable energy system we need. Which would cost the same as seven years of U.S. fossil fuel spending, and could sell the resulting electricity (enough to replace every kcal of fossil fuel) for next to nothing because there would be zero fuel costs. The system would require replacement every eighty years or so, not every twenty years. And would solve global warming. And that system investment would include the cost of putting a free Nissan Leaf in 100 million driveways. And still cost less than raising New York City onto stilts. I'm surprised WUWT hasn't suggested that they just plant ocean sponges along the coast. That will absorb the salt water and provide a renewable resource and a source of income for another craptalist corporation.